The Lexus HS 250h demonstrates innovative engineering and intelligent, driver-inspired design while offering excellent roominess and nimble maneuverability. 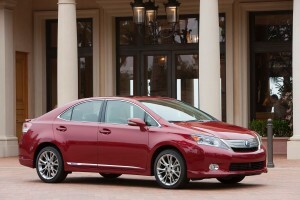 Lexus’ first dedicated hybrid model cruises into the 2011 model year with several exterior color changes. The color palette receives several modifications for 2011 as Satin Cashmere Metallic replaces Golden Almond Metallic, Deep Sea Mica replaces Black Sapphire Pearl and Aurora White Pearl is discontinued. The HS 250h features the Lexus brand’s first four-cylinder gas engine paired with Lexus Hybrid Drive. Peak output equals 147 horsepower and in combination with the hybrid drive motor, the HS 250h generates 187 total system horsepower. The HS 250h also incorporates drive-mode buttons that allow the driver to select between four modes: Normal, Power, Eco and EV. Normal mode has a linear throttle response that gives naturally progressive power. Power mode can be selected for a more responsive feel when desired. In Eco mode, air conditioning settings are adjusted and the throttle response is reduced relative to the pedal angle to emphasize fuel economy. Under certain circumstances, the EV mode can allow the vehicle to be driven short distances using only the electric motors. The HS 250h conveys comfort with its standard leather-trimmed seating, 10-way power-adjustable driver’s seat with power lumbar and eight-way power-adjustable front passenger seat. The electro-luminescent instrument cluster offers fresh methods of keeping track of the various systems in the car and helps the driver to conserve fuel. A hybrid system indicator displays the system output and regenerative charging status, simultaneously indicating the efficiency of driving style.